As you go East in the Alps, the climate is generally getting rougher and the winters in Austria are usually richer in snow than in the Western parts of he Alps such as France or Switzerland. This is a very general rule, however, and exceptions can occur every year. Another general rule with exceptions is the one of seasons: In Austria, most skiing resorts remain closed or semi-open until mid-December with the actual main season not starting until Christmas. It typically lasts until April or May, depending on the year. Here we find the big "but": BUT in some areas of the Alps, in very high altitudes, the season can be significantly longer. In the most extreme cases, glaciers can support a skiing industry almost all or all year round. There are several places in Austria where you can go skiing in July, and enjoy fresh "Champaign powder snow" whilst the valleys are boiling at 30 degrees Celsius. 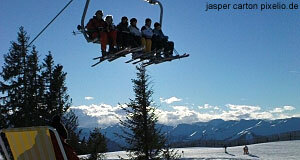 But wait, there′s more: Most of these places with glaciers happen to be nearby some of Austria′s most pleasant spots. So if you are a skier (unlike me, being the one Austrian that doesn′t ski…), you got the ultimate opportunity to race down slopes in Europe′s most dramatic Alpine scenery in the morning and swim in a beautiful lake with a historic town nearby in the afternoon. Needless to say, summer skiing is quite expensive. However, the places where it is feasible sound like a list of "top places in Austria to spend any kind of vacation": In Tyrol, it is mostly the area between Innsbruck and the province of Salzburg. The Ötztaler Alps and the Kaunertal Valley as well as the Pitztal Valley are not only breathtakingly scenic, but also popular with skiers all year round. Further East, the Stubai Glacier and the region around Hintertux have year-round skiing tourism for some of the most demanding glacial slopes of the country (glacier slopes usually tend to be rather not-so-steep). One province down to the East, Salzburg offers glacial slopes alongside with Alpine lakes and towns: Zell am See grants access to the glaciers of the Kitzsteinhorn and nearby Kaprun. Going even further towards the Upper Austrian and Styrian Salzkammergut area, Schladming and the glaciers around the Mount Dachstein are very popular. The snow situation of all these areas can very strongly from year to year. Environmental problems caused by the skiing industry have resulted in many glacial areas becoming not accessible for skiing. It is also worth noting that due to global warming, the Austrian glaciers melt at a rate faster than ever before. The skiing season has become shorter in the past ten years, which also affects glacial skiing - glaciers that offer good snow conditions tend to be much more crowded than they used to be. Two thirds of Austria′s ski lifts are located in areas below 1000 metres in altitude and these are the areas that are most severely affected by warm winters.